Pipeway® is AACANet's proprietary real-time web-based reporting tool that provides both AACANet clients and network service providers working the account immediate access to the most current collections account information in a completely secure online environment. Pipeway is not only free to use but promotes better communication, understanding and control of accounts by having the same information available to all stakeholders in the collection process at the same time. The tools in Pipeway® allow clients to run reports, study graphs and review detailed account information on a select group of accounts or by a single account, tracking activity, cost and performance metrics. The analytical tools of Pipeway help managers better allocate resources to increase profitability. Firms and agencies find the portal useful when discussing accounts with clients, who can view all activity reported. They are also able to view actions reported by others, run reports on select groups of accounts, measure performance and better manage work flow. The State by State page provides valuable information about laws in each state affecting the ability to collect. Users also have access to AIM, the AACANet audit management tool. 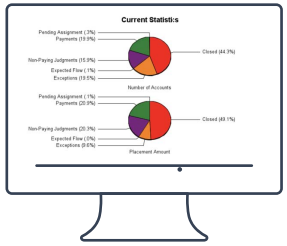 AACANet has designed Pipeway® to allow for quick visualization of groups of accounts, which can be explored in more depth with a simple click. Flexible reports can be run based on a number of factors such as state, portfolio, date and company. The reports also allow users to drill-down to create more in-depth reports for more detailed analysis. These accounts are receiving payment or have been settled or paid in full. Accounts in the Green Pipe means the collection efforts have been successful. The account or group of accounts in the Blue Pipe are moving through the process as expected and meeting all current deadlines. The accounts in the blue pipe are being worked as they should, but just are not in a payment status. Accounts that have resolved their deficiency, but are not back on track, closed or paying will fall into the Purple Pipe. Reports generated on the Purple File can help identify accounts that are slow to progress or judgments where help may be needed to assist with post-judgment collection activity. These are accounts that have been closed with AACANet without being paid in full or settled in full. Users can run a report or access individual files to review the reasons why the account closed.